The Imperial Palace is the main residence of the Emperor of Japan. It was built on the site of the old Edo Castle which the Tokugawa Shogunate had lived in for roughly 260 years. The Palace contains several buildings including the main palace, the private residences of the imperial family, an archive, and administrative offices. The total area including the gardens is 3.41 square kilometers. During the height of the 1980s Japanese property bubble, the palace grounds were valued by some as more than the value of all the real estate in the state of California. In 1590, Tokugawa Ieyasu, the first Shogun of the Tokugawa Shogunate settled his home on the site where a small castle had already existed since the 12th century. At that time, Edo was a small, rural, but critical port town, which was located far from Kyoto, the then center of culture and politics in Japan. 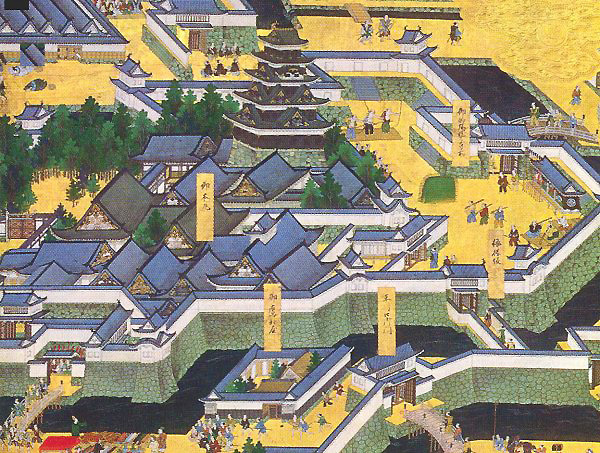 When settling in Edo, Tokugawa Ieyasu created a magnificent castle by renovating the existing castle. The renovated castle had 99 gates, 21 watchtowers, of which 3 are still standing, and 28 armories. The outer defenses stretched from present day Shimbashi to Kanda. Completed in 1640, it was the largest castle in the world at the time. 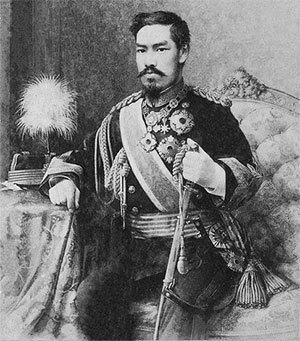 After the breakdown of the Tokugawa Shogunate in 1868, the last Shogun Tokugawa Yoshinobu, was ordered to vacate the premises of the Edo Castle, and the Meiji Emperor migrated from the Kyoto Imperial palace to the Edo Castle, which was later called the Imperial Palace. It was the first time for Emperor of Japan to live outside Kyoto in the history of the Imperial family, a period of more than 1,800 years. On a night in May 1945, most structures of Imperial Palace were destroyed in the allied firebombing raid on Tokyo. 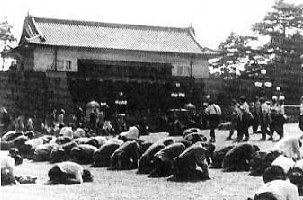 The Showa Emperor declared the capitulation of Japan from the basement of the concrete library in August 1945, thereby ending World War II. Except for the Palace’s East and Outer Gardens, the Palace is generally closed to the public. 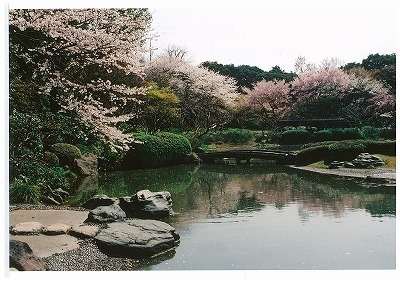 A large number of people enjoy running around the palace and viewing cherry blossoms along the moats in the spring. Each New Year, as well as on the Emperor’s Birthday, the public is permitted to enter through an inner gate. 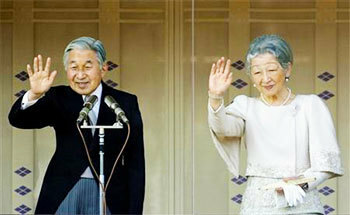 The imperial family appears on the balcony in front of the crowd to give a short greeting speech, thanking the visitors and wishing them good health and tidings. This is a large park located on the southeast side of Imperial Palace. It was originally a garden for the Imperial family, and became open to the public as a national park in 1949 after World War II. The main area is covered with gravel roads and lawns, with black pine trees on the beautiful lawns being particularly dramatic. In the Edo era, the house of the Castle’s chief servants was located here. 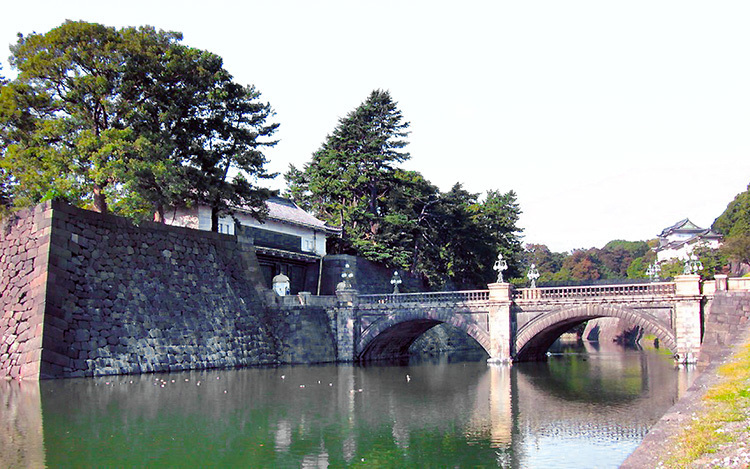 As you proceed into the park, you will be able to see Nijubashi Bridge, the well-known symbol of the Imperial Palace. Near the Babasakimon Gate stands a bronze statue of Masashige Kusunoki, loyal Samurai in 14th century. In the Outer Garden is a statue of Kusunoki Masashige, a 14th-century Samurai who served Emperor Go-Daigo when the Emperor attempted to wrest rule of Japan away from the Kamakura Shogunate. 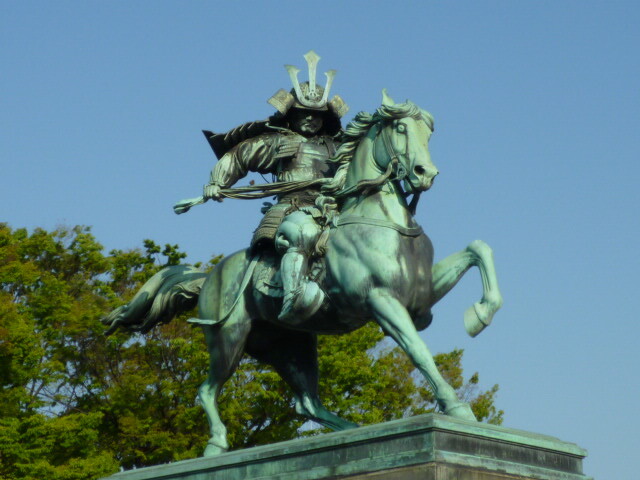 Kusunoki Masashige is remembered as the ideal Samurai because of his loyalty to the Emperor. Long after his death, he received the highest decoration from the Meiji Government of Japan in 1880, which began 12 years after the Meiji Restoration. In 1991, this statue was established and dedicated to the Meiji Emperor from the Sumitomo family, a founder of the Sumitomo Group. 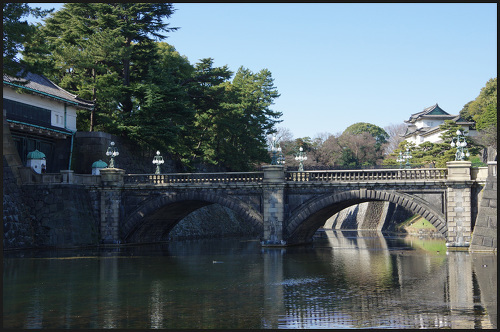 Two closely located bridges led over the moats, one called the Imperial Palace Main Gate Stone Bridge, and another called the Imperial Palace Main Gate Iron Bridge, respectively. The Iron Bridge is also known as Nijūbashi, literally meaning “double bridge”, because the original wooden bridge was built on top of an auxiliary bridge, due to the deepness of the moat. The Stone Bridge is also called Meganebashi, literally meaning “Glasses Bridge” because of its glasses-like shape. Both bridges altogether are often mistakenly called Nijūbashi, because two bridges are so closely located and look like “Niju”, or a ‘double’ bridge. You can see those bridges from the Outer Garden, but the bridges themselves are closed to the public except on January 2 and the Emperor’s Birthday in December. The Imperial Palace East Gardens are a part of the inner palace area and are open to the public except for Mondays and Fridays. They are the former site of Edo Castle’s innermost circles of defense, the Honmaru, or “main circle”, and Ninomaru, or “secondary circle”. None of the main buildings remain today, but the moats, walls, entrance gates and several guardhouses still exist. A wide lawn and the remaining foundation of the former castle tower can be found on top of the hill, where the castle’s innermost buildings once stood. The castle tower was completed in 1638, as the tallest castle tower in Japan’s history. However, only a few years later in 1657, it was destroyed by citywide fires, and has not been rebuilt since. The entrance to the East Garden is the Ote-mon Gate, once the main gate of Edo Castle. Here, you will come across the National Police Agency Martial Arts Hall called the Sainei-kan, and the Ote Rest House, where for ¥100 you can buy a simple map of the garden. The Museum of the Imperial Collection next door features rotating exhibits of Imperial Household treasures.